A 12-song album of original Contemporary Folk songs by singer-songwriter Holly Hanson and guitarist-songwriter Steve Hayes. Published poet turned singer/songwriter Holly Hanson and guitarist/songwriter Steve Hayes, collectively known as Neptune’s Car, blend their lyrical and musical sensibilities together on their debut album Strawberry Moon. Holly sings in a smooth, relaxing vocal style as she relates each tale in rich detail while Steve’s expressive guitar playing thoughtfully supports each melody. Strawberry Moon will thoroughly charm the listener. The appeal of this album is ageless as both young and mature audiences will enjoy these carefully-crafted story songs. The recording of Strawberry Moon is the culmination of six years of songwriting. Many of the songs grew out of Holly’s research as a teacher homeschooling her two sons. “The Charm,” for example, was formed out of a lesson about pirates and life at sea. As the collection of songs grew, Holly sought out the musical companionship of fellow guitarist Steve Hayes. Steve’s guitar playing and harmony vocals added a lively acoustic layer to the songs, and friends commented on the chemistry between the two musicians. In November 2009, Holly and Steve went into the studio at Signature Sounds in Pomfret, Connecticut. While in the studio, Steve called in some of his friends who he knew would be a wonderful addition to the overall sound — violinist David Eure, upright bassist Sven Larson, and percussionist Zeke Martin. Holly says, “David [the violinist] asked me to describe what each song was about. Then, he infused each song with exactly the right mood of lilting violin or foot-stomping fiddle.” The sounds of the songs range from folk to country and cover themes such as road songs (“Follow This Highway” and “When the Moon Shines on the Chrome”), ocean songs (“Lighthouse Keeper,” “Ocean-Born Mary,” “The Charm”), a wedding song (“Five-Point Star”), a fun love song (“Sparks”), a Western (“Roll with the Tumbleweeds”), and more. Holly and Steve call themselves Neptune’s Car after the title of a historical biography song that Holly wrote. Neptune’s Car was a clipper ship. In 1856, nineteen-year-old Mary Patten navigated the ship around Cape Horn to complete her husband’s voyage from New York to San Francisco after he became ill at sea. This story remains one of the most heroic tales of the sea. Many interesting tales make Strawberry Moon, an album full of literate songwriting, a stand-out debut by this new duo. "Strawberry Moon" is the freshest, most beautiful folk album I have heard in a long time. Once you listen to it, the haunting melodies will keep going over and over in your head. I discovered the album this weekend and my wife and I have been listening to it every day since. Every track is a treasure with no duds or fillers. 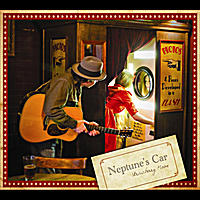 Neptune's Car has a great musical future and I am glad to have caught this duo at their outset. Buy this album. You won't be disappointed. Strawberry Moon by Neptune's Car.... is an ambitious and superb first (CD) album by singer-songwriter Holly Hanson, accompanied by Steve Hayes and friends. Holly and Steve have put to music the sensitive and far-reaching poetry and storytelling of Holly's gifted muse. Mix in her gentle, clear voice and folk, acoustic guitar, and you have one of the most musical albums to arrive on the scene in a long time. Steve Hays contributes a song of his own, while singing harmonies and playing various instruments on the album. Together the couple make a playful new duo! Whether the song is a road trip through red-rock canyons, the solitary world of a lighthouse keeper, or the sparks of a new love affair, Holly's lyrics and music seem to come together in a naturally satisfying and artistic way. This is a beautiful and well-produced offering. Your ears will be delighted and your heart will sing along! Worth a listen if you like folk and country music, and the recording quality is also top notch.